When you leave the dock for a day of boating, are you prepared for the unexpected? Are you ready to handle an emergency? 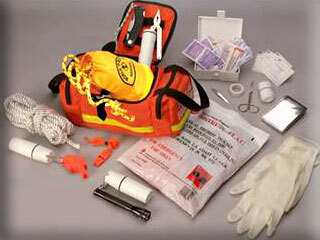 Akar Logistics's Boater's Safety Kit™ can help. Dave Krueger, founder and president, has created this kit after 8 years of Marine Patrol and Search & Rescue on Lake Erie. Too many times I have been involved in Search & Rescue operations where the victims did not have the necessary resources to assist themselves. When an emergency strikes on the water, you can't get out of the boat and wait for someone to come along and help as you can on the road. Many times you are on your own, or help is delayed in getting to you, says Dave Krueger. Accidents can happen on smaller lakes, even where you can see the shore. The bag is designed to float; and it is constructed of durable nylon fabric, which is also high visibility orange and is mold and mildew resistant. Rescue Throwbag (50' of floating line) Unless you are trained in water rescue, it is suggested that you never jump into the water to save someone who is conscious. It is always safer to throw something to them. That is what this bag is designed to do.